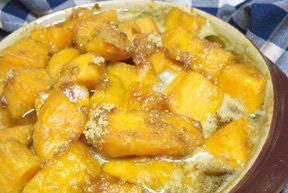 Sweet potatoes candied with brown sugar and butter. 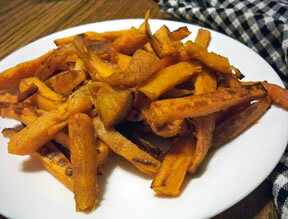 An easy to make sweet potato side dish. Cover sweet potatoes with cold water in cooking pot. Bring to a boil and cook for 25 to 30 minutes until fork tender. Drain and let cool. Peel and slice into about 1/4 to 1/2" slices. 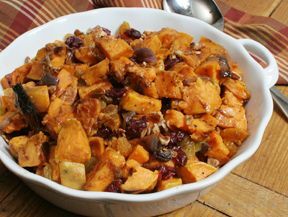 You can use 1 or 2 large cans sweet potatoes for a quicker method, but the fresh do taste better. In a greased oblong glass dish, layer half the sweet potatoes, half the brown sugar, and half the butter. Repeat layer. Bake at 375 degrees F. for 30 minutes. After 15 minutes of baking time, you will need to spoon the liquid on top of the potatoes to moisten the top layer. Also do this just before serving. "I tried this recipe this last weekend. The sweet potatoes tasted OK but there was way too much brown sugar and the butter could have been cut back also. I am glad I tried them before I make them for Thanksgiving. Guess I will try a different recipe."